finding GOD together is a family program designed to initiate children (3rd grade or above) to the Catholic faith and sacramental life. Children attend Religious Education sessions (GATHER) AND finding GOD together sessions. Parents attend the Adult Formation sessions at the finding GOD together sessions simultaneously to support their child’s faith as well as grow in their own faith. At the end of the process, the child will receive the Sacraments of Baptism, Reconciliation and First Communion, as needed. 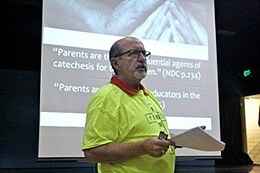 Afterwards, the child(ren) will resume in their grade level in the GATHER; Family Faith Formation Sessions. Why is finding GOD together needed? We understand there are many reasons why a child has missed receiving the Sacraments of Baptism, Reconciliation or First Communion. finding GOD together provides the opportunity for catching up! The Roman Catholic Church teaches that children over the age of reason (about age 7) cannot be baptized through the traditional infant ritual. The Church requires a period of instruction to prepare children for initiation into the Catholic faith. At the Second Vatican Council, the Church acknowledged that Catholic parents are “first and primary teachers of the faith for their children.” It also stated that parents must be instructed in the faith, so that they are capable of passing on this faith to their children. Parent and Child must attend Saturdays 9:30-11:30 AM in Education Center. Click here for information on how to benefit St. Margaret Mary Education Programs.